This past Sunday, Pastor Mike discussed Harvest: our history, our present, and our future. It was a great message that touched on the roots of our church, our values and what is important here at Harvest [Listen Here]. 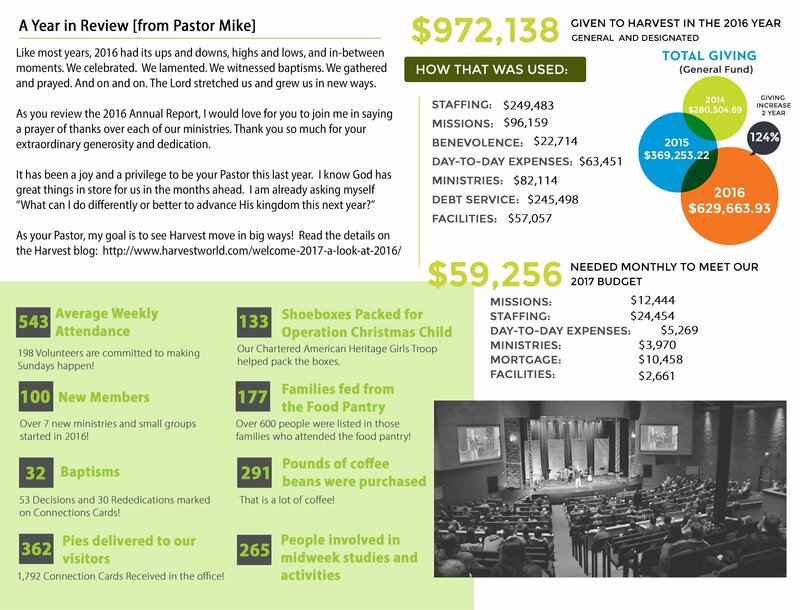 He briefly introduced the staff (meet them here), talked about the missionaries we support (read more about them here), and went over our 2016 Annual Report. 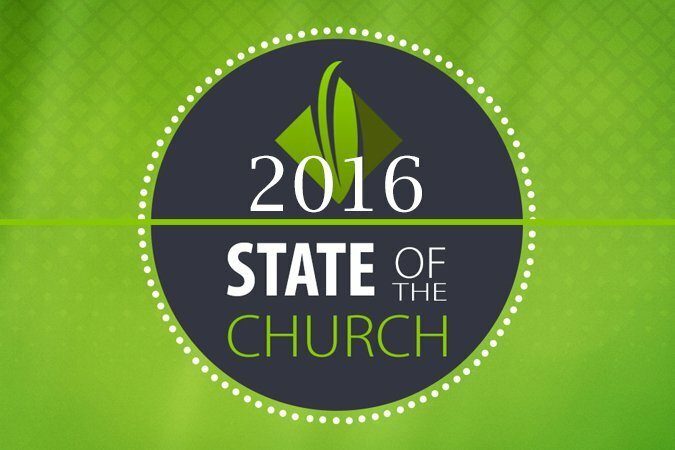 To download a PDF: 2016 Annual Report. 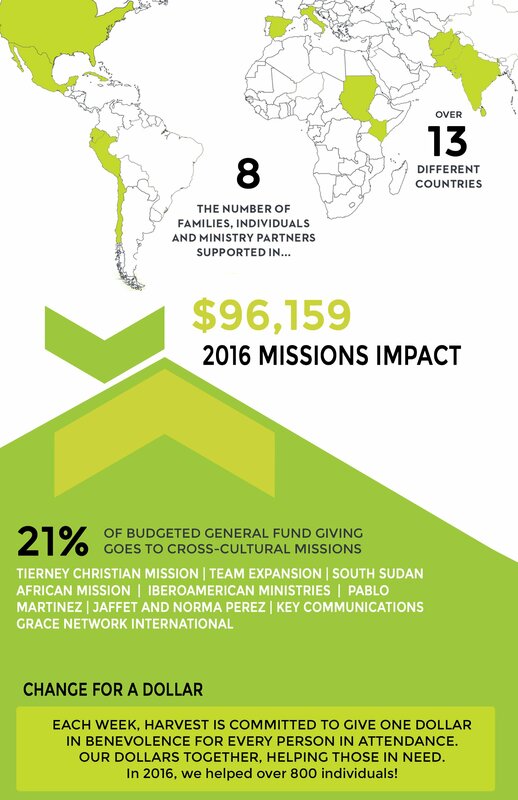 Take a look below at the 2016 Annual Report. It might look like a bunch of numbers, but it is important to remember that every number represents a unique individual with their own story. 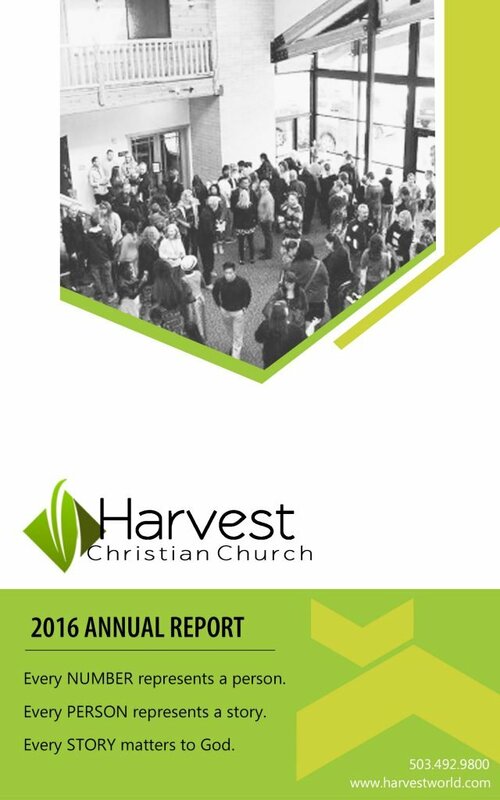 Here at Harvest, we aren’t about numbers – we are about the people. As a staff and leadership, we are so excited about the upcoming year and what is in store for 2017. To read more about some of our goals, check out this blog post: Welcome 2017! Recently, on a Saturday, I joined three ladies from our congregation during a morning of service at Adorned in Grace. We only had room for a small group in their back storage area. 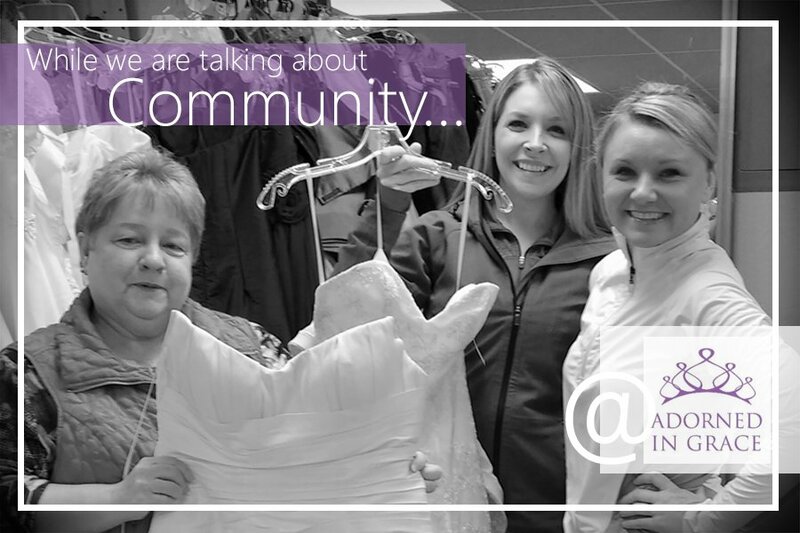 When we arrived, Dottie from Adorned in Grace, walked us around their showroom and explained what their mission is. Adorned in Grace is operated under Abolition Now, a Portland Christian non-profit dedicated to efforts against sexual trafficking and care for its victims. 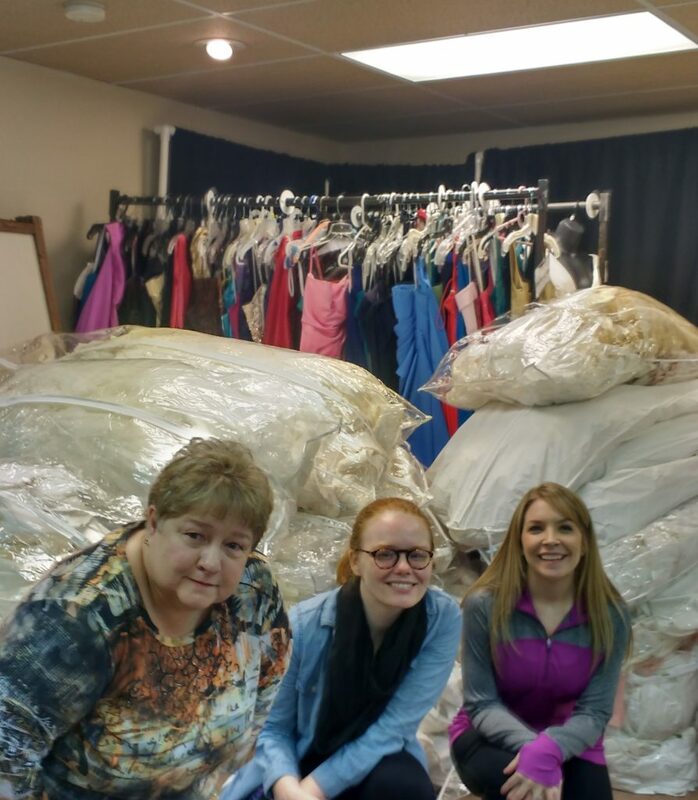 They operate on peoples’ generosity alone: the dresses and space are donated, they are staffed with volunteers, renovations were donated to the old building formerly owned by another local church, and their income comes from the sale of the donated items. The organization loves receiving dresses with stories attached to them, it makes it the most fun for them to be bought and used again. They have some dresses that do not sell so they re-purpose them through either saving precious pieces of them or by donating them to the next organization that they collaborate with. and have their own day of getting dressed up and just being carefree girls who get to feel great about themselves. 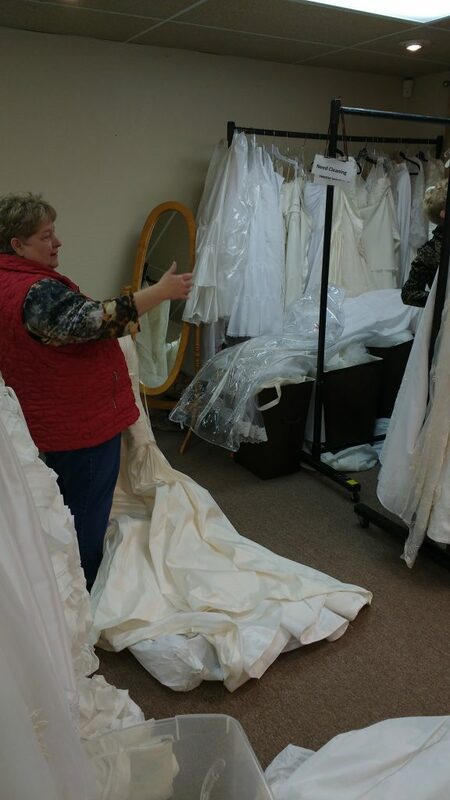 The wedding dresses in this room are where we came in. They were being sent to the next ministry because they had not sold at AiG. We put three or so in a dress bag, zipped it up, and laid it flat. Then on to the next dresses. While doing this we were able to get to know each other better and enjoy using our own basic capabilities to serve. We have been stressing building community here at Harvest. My husband Kyle and I moved here because of the incredible community he had experienced here when he was an intern. Now we are trying to improve upon that by creating new small groups and trying to convince you that it is worth it. I completely agree. I want each one of you to experience deep Christian community. I want you to cry and laugh together, to offer godly advice and commiserate gently over not quite getting it right, and to see different aspects of God through getting to know more of his people. We each have unique talents and interests, we have different backgrounds, and we each understand God and his kingdom slightly differently. We can learn from each other and become better for it. I hope that you all see this and embrace it. It might be scary at first but it is worth it, I promise. Here is another way that I propose we build community: Let us go serve together. I am not suggesting this in place of a small group, but rather an additional way to be plugged into to the body of believers. Maybe your small group would want to get involved in a regular service project. This might be putting the cart before the horse, but email me and I can help you get that set up. 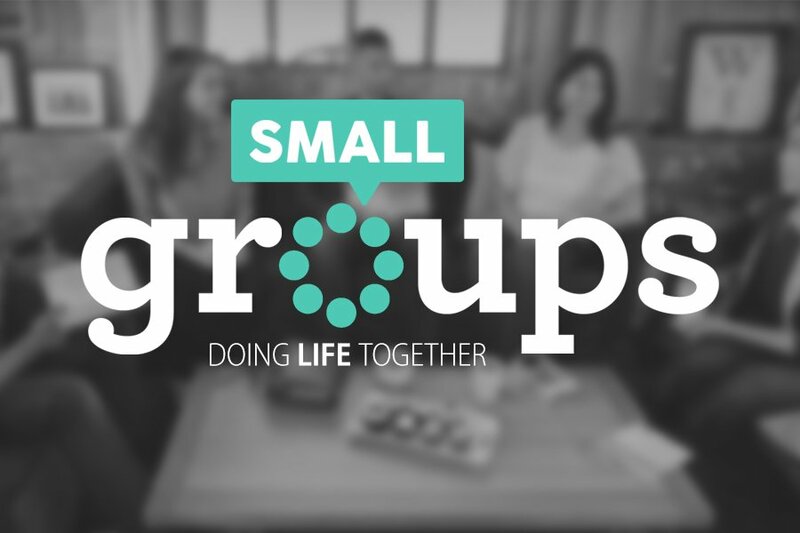 Maybe you end up loving your small group but want the opportunity to meet more people outside your small group. 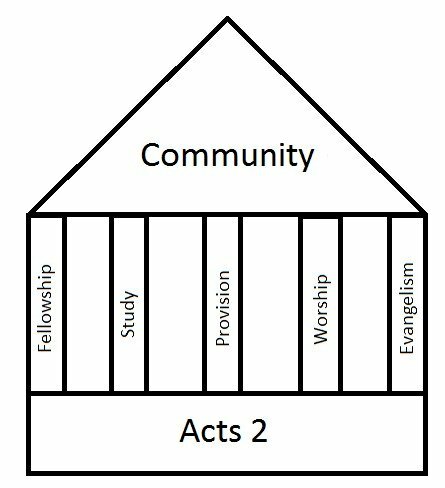 I (Faith) will be setting up periodic opportunities to serve somewhere that is available to our entire church body; it is a great chance to meet different people. It is also a great chance to know what is outside our specific gathering of Christians, to meet at these communal places of ministry between regular church gatherings. In addition, after serving together, you get opportunities to meet people and get to know them on a much deeper level. For instance, at Adorned in Grace, we all really enjoyed getting to know each other and what the ministry was a part of and how it operated. It was a precious experience, getting to be in the room with these lovely symbols of such a happy and important day. In the future, I plan to arrange more service projects at Adorned in Grace, My Father’s House, and at the Pregnancy Resource Center. If there is any place that you strongly stand behind or serve on even a semi-regular basis, I want to know and see what we can do with our resources of people here at Harvest. There are other opportunities besides these! Local ministries constantly need volunteers. Grab a few friends and go serve. I can even point you in the direction of the ones in need. Our Care Ministry has a meal train-grab a few people you want to know better and make a meal for a new mom or a grieving family. Serve a family on your block by bringing over some treats. There are many levels of application for what I am advocating. I think service is another vital part of community, but not exclusively in serving others. Serving with others is a great tool, if only on this level: it’s easier to get to know someone when you are working, when you have something to do to take the awkwardness away? To start, here at Harvest you will be seeing regular announcements for opportunities to serve. 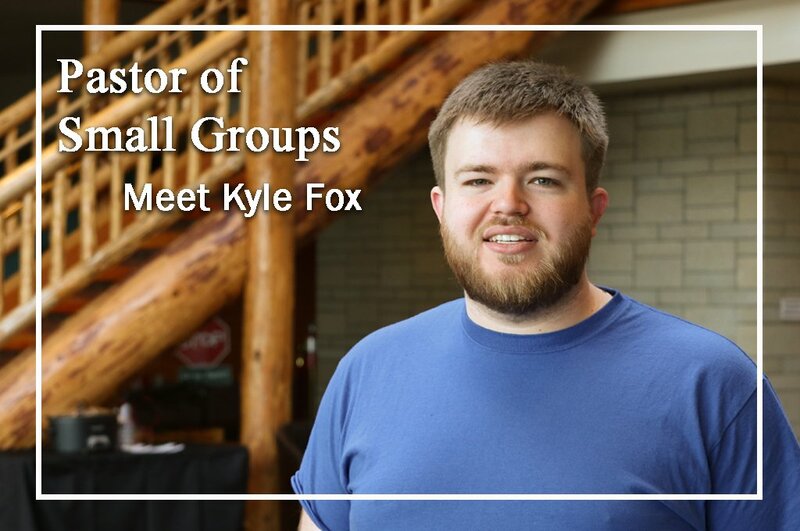 I would love to see an enthusiastic response, both from people who enjoy getting to know each other and from people who just enjoy getting to know and be involved in different ministries. These will be low commitment…a few hours on a Saturday morning or maybe the odd evening. If you have a million things happening in your life, these will hopefully still fit in from time to time. Many of these projects will be a great activity for the whole family! We’d love to see you there. There is a famous parable, told by Jesus in Matthew 25, which we know simply as The Sheep and The Goats. In this particular parable, Jesus transports us into the future when he comes again “in all his glory” to sit on his throne. In this scene, all the nations of the earth are gathered together, in front of the throne, and Jesus begins to separate them into two groups – the sheep and the goats. The ones who are blessed are the ones who lived lives of love and compassion, and it showed in their actions towards the people around them. The ones who are cursed did not act in such a manner, and they are condemned because of it (vv 42-45). This parable shows us that both the righteous and the wicked are affected – in an eternally significant way – by their actions. It is at this point that we sit up a little bit straighter and think, “But what about grace? Our salvation is a gift offered to us, it isn’t something that can be earned!” The good works (or actions) that the sheep display in the parable are not the cause of salvation but the effect of salvation and the manifestation of the indwelling of the Holy Spirit. 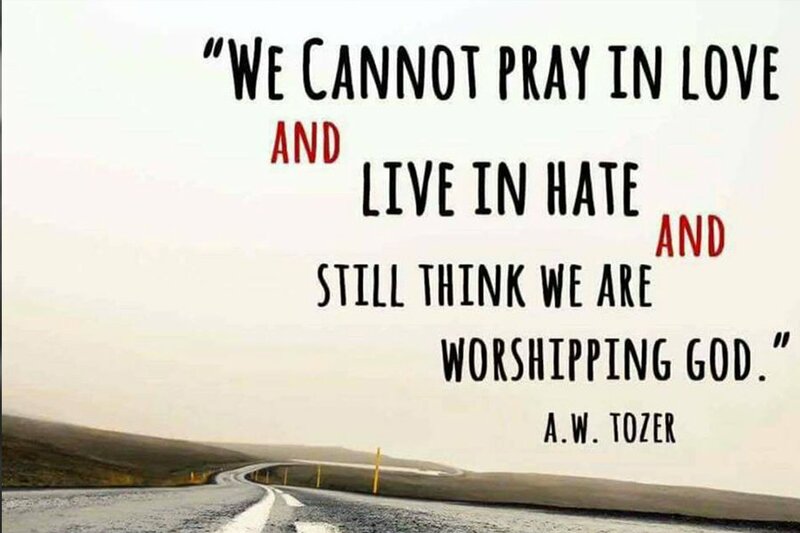 As Christians, we should act different because we are different! The Apostle Paul exhorts us in Galatians chapter 5 to “live by the Spirit” and not to “gratify the desires of the flesh” (v 16). The Spirit and the flesh, he goes on to say, are at odds with each other. The flesh desires that which is opposed to the Spirit; it desires sexual immorality, impurity, extravagance, idolization, hatreds, conflict, jealousy, anger, disagreements, rebellions, divisions, bitterness, drunkenness, and riotous behavior (vv 19-21). The Spirit desires that which is opposed to the flesh; it desires love, joy, peace, patience, kindness, generosity, faithfulness, gentleness, and self-control (vv 22-24). What we do matters. As Christians we are to become like Christ, we act as ambassadors to the world on behalf of Christ. When the world looks at us, they should see sheep. They should see people who feed the hungry, give drink to the thirsty, welcome the stranger and the foreigner, clothe and care for the sick and needy, and show compassion for those who have fallen so far as to wind up in prison. Faith and worship are not exclusive to an hour on a Sunday morning – they should be evident in every aspect of our lives. The fleshy desires of our hearts need to be overridden by the desires of the Spirit. These changes may begin inward, but they will ultimately ripple out into the world and to the people around us. Our lives are a testimony of who we serve. Do our lives serve to further sin and death, or do we live to serve in obedience to Christ who leads us to righteousness? In Christ, we are free – not free to sin or to live in hate or selfishness, we are instead free FROM living in such a way. So let us live lives of compassion and love. Let us not be afraid to do good and to stand for what is right. “For God did not give us a spirit of cowardice, but rather a spirit of power and of love and of self-discipline” (2 Tim. 1:7). Let us go bravely forward into the world as God’s representatives, to be His hands and feet and to continue the work that Jesus began while he was here on earth. Let us pray, daily, that God’s will be done here on earth, as it is in heaven. For the Kingdom of God is near.